Here is a fun Valentine treat to make with kids and is easier than your traditional frosted sugar cookies. 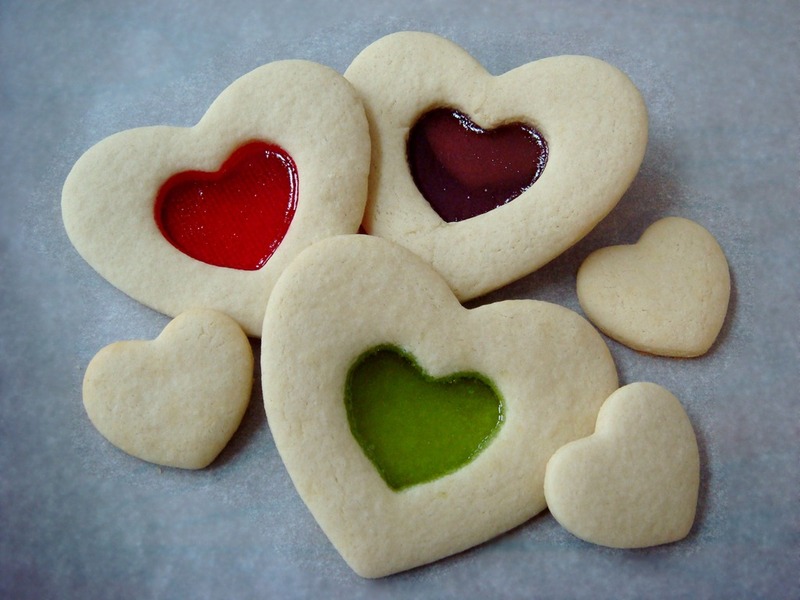 All you need is a good sugar cookie recipe, a package of Jolly Rancher hard candies and two different sized heart cookie cutters. To begin, you will need to line your baking sheets with silicon mats or parchment paper. Non-stick foil might work as well, but I haven’t tried that yet. Prepare your dough and cut out large hearts. I usually like to make nice thick sugar cookies, but these need to be about 1/8” thick, or the center “window” will be too thin compared to the cookie. 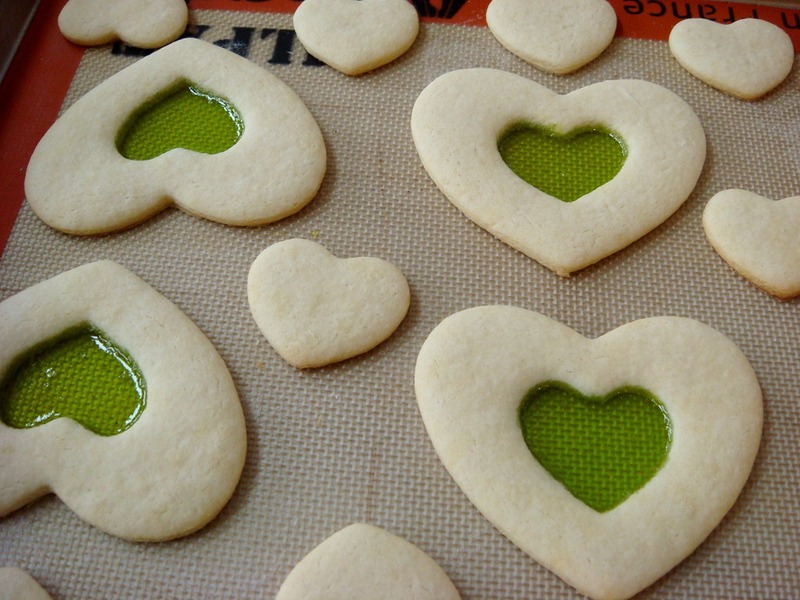 Place cookies on baking sheet and then cut out the smaller heart in the center of each cookie. Cutting out the smaller heart after the cookie is on the baking sheet helps the cookie dough retain its shape. It is harder to move cookie dough with the center cut out. 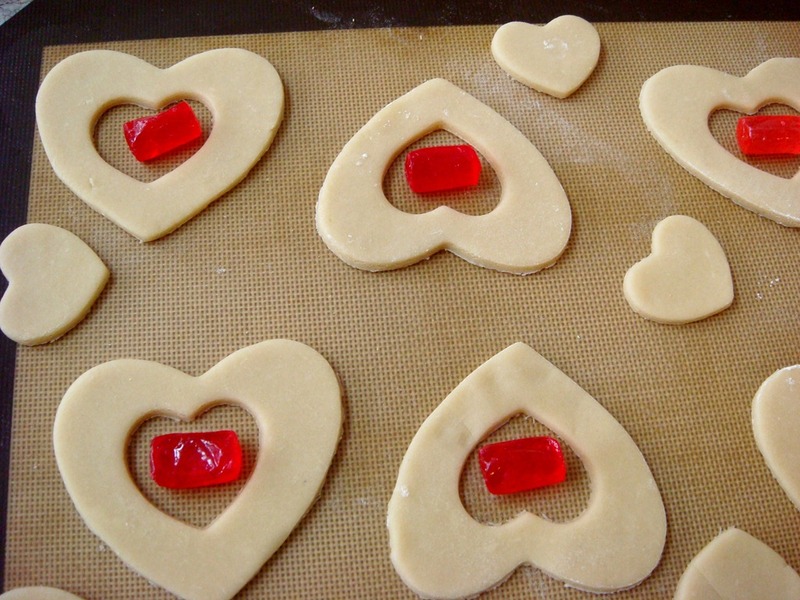 You can bake the little hearts along with the big ones, or reroll them with your dough scraps. Place one Jolly Rancher candy (whole) in the center of each cookie. If your openings are smaller than the candies, you can crush the candies first, but I found that there are fewer bubbles in your windows if you leave the candies whole. And it is so much easier than crushing hard candy! You could also make these into cookie pops by inserting lollypop sticks into the bottoms of each heart before baking. It would also be fun to make some for other holidays using different cookie cutters, or a linzer cookie cutter (crush candies first if using a small linzer cutter). Or a gingerbread man with a tiny cut-out heart. Chill for 20 minutes to 1 hour, if necessary, for easier handling. Roll out dough to about 1/8” and cut with large heart cookie cutter. Cut out a smaller heart inside of each cookie. You can bake these plain smaller hearts, or re-roll them with the dough scraps. Place hearts on a baking sheet lined with a silicon baking mat or parchment paper. Place one whole Jolly Rancher candy in the center of each heart. Bake at 375°F for 9 -10 minutes, or until candies have melted; cookies should not be browned on the edges. They should look white when done. Cool completely on the baking sheet. When candy centers are completely cool and hardened, remove cookies to a sheet of parchment paper.